I often get asked, at pen shows or by e-mail, what fountain pens I use on an everyday basis. I do change them up a lot, which is how I manage to keep up the pace on pen reviews, but there are several pens that are “constants” in my rotation. What is a “Workhorse Pen”? 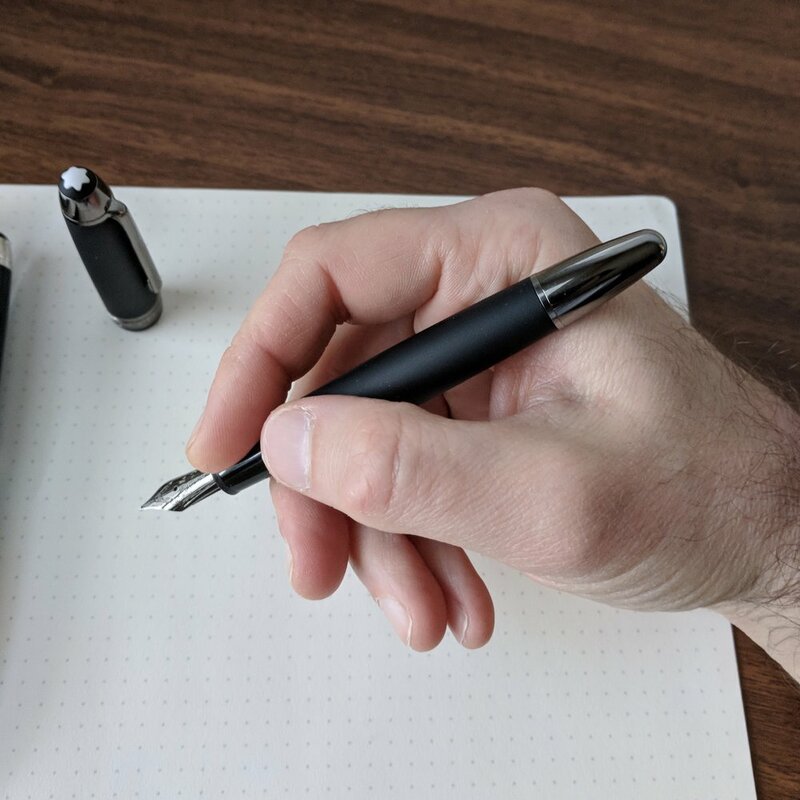 The term “workhorse” gets thrown around a lot in pen reviews, casually used to denote a pen that’s not necessarily fancy, but rather intended to serve as a utilitarian daily writer. I’m as guilty of this as any. The problem with such broad categorizations, of course, is that one person’s “workhorse” might be completely impractical for another. For example, the TWSBI 580 is commonly offered as an example of a reasonably priced pen intended as an everyday writer, but it doesn’t work for me as a personal “workhorse” because I can’t post the cap (more on this below). So before I get started on this new series of pen reviews, I wanted to take a few moments to define my criteria for considering something a “workhorse” - something I’ll keep inked up nearly 100% of the time. The pen must post. Just as the watches that I wear need to have a “date” complication, the pens I use every day need to post. I often have a “busy” desk full of documents that I’m working on, or trying to sort out into some order that makes sense. I can’t worry about where I set the cap to write because it will go missing. I’m speaking from experience here. I have pens that don’t post, but they’ve been living in the Penwell. The pen must be well-balanced. For someone who takes perhaps a dozen pages of handwritten notes per day, my pen can’t cause my hand to cramp. If the pen is lightweight, there’s a broader range of lengths that will work for me, but a pen that’s too long, especially if it’s back-weighted when posted, is a nonstarter. The design must be understated. I spend a lot of time sitting in courtrooms/depositions/boardrooms taking notes, trying to be inconspicuous. I leave any flashy or “unique” fountain pens at home. Sorry, Visconti. The nib can’t be too wet to write decently on cheap paper. Most nibs can be tamed with smart ink selection, but some (i.e. most Omas and Visconti nibs) write far too wet with any ink for me to be able to use them at work. The pen must have a relatively large ink capacity. It pains me to say that I generally can’t use Sailor pens with nibs broader than a “fine”, since the Sailor converter has a ridiculously small capacity. Sure, I can use cartridges or switch pens in the middle of a meeting or deposition, but there’s no good reason why I should have to. I really had to work to get this 1980s-era Montblanc 146 medium stub nib to write perfectly. Subsequent Montblanc purchases haven't been as finicky. It’s been years since I reviewed the Montblanc 146, and I’ve owed this iconic flagship a revisit. When I first published my review, I struggled with an iffy, 1980s-era medium nib that Mike Masuyama finally managed to fix. I now love that original pen, and I over the years I’ve picked up two more: a 146 Ultra Black and a 146 UNICEF limited edition. From Left: The Montblanc 146 UNICEF Special Edition; the Montblanc 146 Ultra Black, and my standard 146 (1980s era). 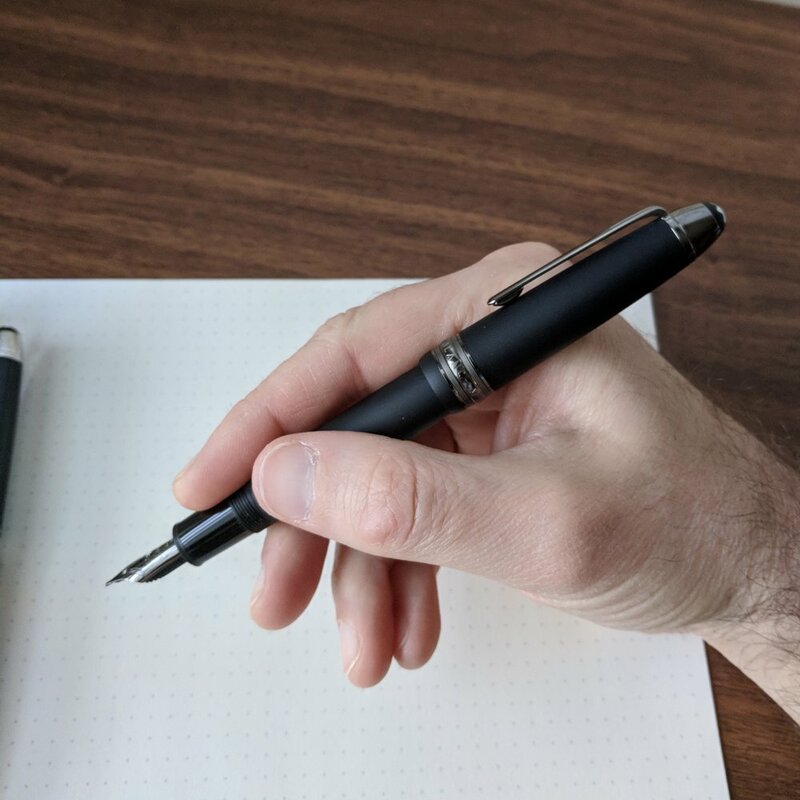 Along with the Edison Menlo, Lamy 2000, and Sheaffer Legacy (other great “workhorses” that will get the same treatment here in the coming months), the Montblanc 146 has the perfect shape and functionality for me to use every day. The pen posts, has a well-balanced torpedo/cigar shape, and holds a ton of ink. Nibs are where Montblanc will get you. Their standard nibs aren’t necessarily bad, but they tend to be over-polished with a bit of a baby’s bottom, meaning that they will hard start occasionally, especially on super slick paper like Rhodia or Clairefontaine. Mike Masuyama has ground most of my Montblancs to a .6mm stub/cursive italic hybrid, which makes for a very smooth writer that still retains a bit of line variation. I generally prefer cursive italic nibs over stubs for everyday use because they aren’t as wet for when you need to write on cheap paper. The "Snowcap" isn't an uncommon sight in the corporate world, even today. I’ll go ahead and address this because I know I’ll get the question: Doesn’t using a Montblanc violate Rule No. 3 (“The pen must be understated?”) Not for my purposes. Montblanc pens are fairly common in the corporate world, so unless you’re going to use something like a Skeleton or one of the crazier Writers Editions, you'll attract little, if any, attention. The ruthenium plated nib on my Montblanc 146 Ultra Black. The 146 also doesn’t have to be a pen that breaks the bank. If you’re looking for a pen in decent working condition, and don’t mind dealing with a few cosmetic blemishes, you can find them for as low as $250 at pen shows, which is around the same price as a new Sailor Pro Gear or 1911. Sure, the special editions will set you back a bit more, but the prices are generally in line with the rest of the market, provided you shop around and don’t pay MSRP at the Montblanc boutique. Pen Shows. Where I purchased my first Montblanc 146. You can find exceptional pricing at pen shows (often 10-20% below what retailers sell for online), especially if you're willing to look at a secondhand pen, which is where I'd suggest you start. Larger shows like the D.C. Pen Show will have the best selection. Anderson Pens. Our sponsor Anderson Pens is an authorized Montblanc retailer that sells both new and gently used pens, including the 146. They sometimes have stock that is not listed on their website. Be sure to reach out and let them know exactly what you are looking for. Appelboom. Appelboom, another sponsor and authorized Montblanc reseller located in the Netherlands, carries the full range of Montblanc Pens, including the UNICEF and Ultra Black 146 pens pictured here. I purchased a UNICEF 144 Classique from Appelboom and was very pleased with the experience. Disclaimer: I purchased all three pens shown in this review with my own funds, for my own use. This post does contain affiliate links. Editor's Note: The "Workhorse Pens" series is something new that I tried. Did you like this series? Did I leave anything about the pen out that you wanted to know? Do you have any additional questions about how I use my pens that you'd like me to address in future installments? Should I drop this entirely? Let me know!